Stacey and Adriano chose me as a wedding photographer Costa Smeralda Olbia Sardinia for their incredible wedding day. The plan was exciting and challenging since the first time we spoke over Skype. They both live in UK, Stacey is British and Adriano Sardinian and chose Costa Smeralda as location. This is how the wedding day unfolded. The night before the wedding, Adriano had set up a surprise with a serenade sang by Tenores di Bitti under Stacey’s balcony. It all happened at a beautiful hotel in Arzachena, surrounded by nature with typical sardinian stazzu where guests were accommodated. When Stacey appeared at the balcony, she found the small crowd in semicircle to welcome her with, at the center, the Tenores singing. Needless to say, the moment was really touchy for everyone along with the right lighting and the amazing decorations. Then the party started and we all enjoyed a nice and tasty buffet that went on till late nite. Federico ( videographer) and myself were kindly accommodated at a nearby bed and breakfast so we could be there very early the next morning to cover preparation of all bride, groom and guests. I have to say that, by booking us since the day before, they have benefit of a total coverage of the event, allowing us to catch unique and candid shots and footages. That is always a winning choice for having a full story told from beginning to end. We then moved to San Pantaleo beautiful church were the traditional ceremony was held. There was an aperitivo with cheese and local product tasting by the stone-made square outside the church where some family and friends shots were taken. Stacey and Adriano jumped into a vintage volkswagen beetle to head over Tombe dei Giganti in Arzachena, were we had previously planned the couple session would have been held. It lasted about 20 minutes and we took some amazing photos whit the sun setting down and casting a nice light through the giant olive plants and vegetation. We then went back to the restaurant by the Hotel in Arzachena where all the guests waited for the couple to arrive. The evening went on with a buffet by the pool, a cover band entertaining the guests and magnificent moments and atmospheres to be captured for the delight of the couple afterwards. Please use the contact form to enquire about your wedding, engagement or any other questions about the service you require. 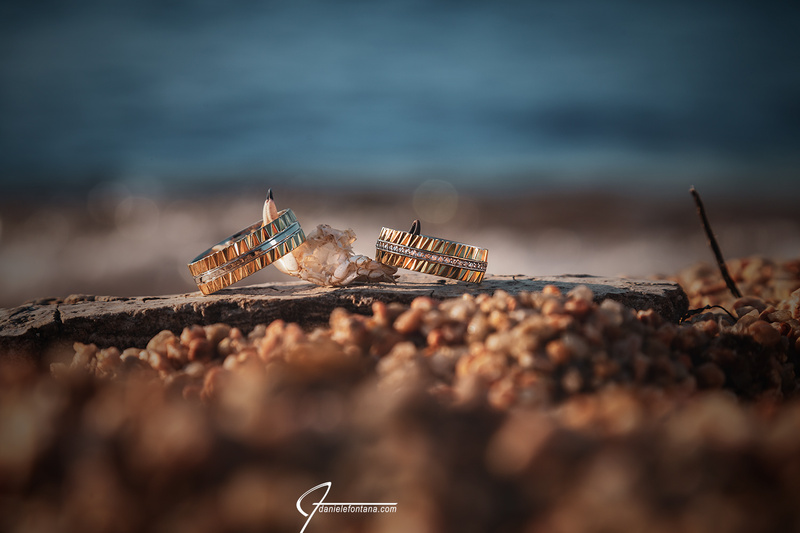 I will be happy to be your wedding photographer Costa Smeralda Olbia Sardinia providing you with all necessary details to plan your event the best and smoother way possible. I’m also available to travel everywhere in Sardinia, Italy and abroad. Also, head over my main website www.danielefontana.com for hundreds of photos to have a clearer idea of my personal style. Thank you for your kind visit. All images are © of Daniele Fontana and weddingsardinia.eu. No reproduction or use allowed prior written permission.